I joined the Breadbakers baking group this month after a really long time and the bread of the month is anything baked with fall fruits and vegetables -apples, pears, persimmons, grapes, quince sweet potatoes, potatoes, figs, cauliflower, broccoli, squashes and cranberries. I picked potatoes as my choice as I had been eyeing this recipe for a really long time. Infact, two different cookbooks had two different recipes but I narrowed down and picked the healthier of the two. In addition to mashed potatoes, this bread is made with the addition of wholemeal bread flour that I picked up on sale at Spinney’s a while ago. While I never go looking for bargains whenever I do my groceries, a ‘sale’ signboard got my attention. A lot of flours, especially bread flours were on sale as they had a month to go before expiry and at one third the price, the deal was a steal. I had never worked with bread flour before and this one was stone ground wholemeal flour, perfect for the recipe in mind. However, regular wholemeal flour (whole wheat flour/atta) will work just as fine. 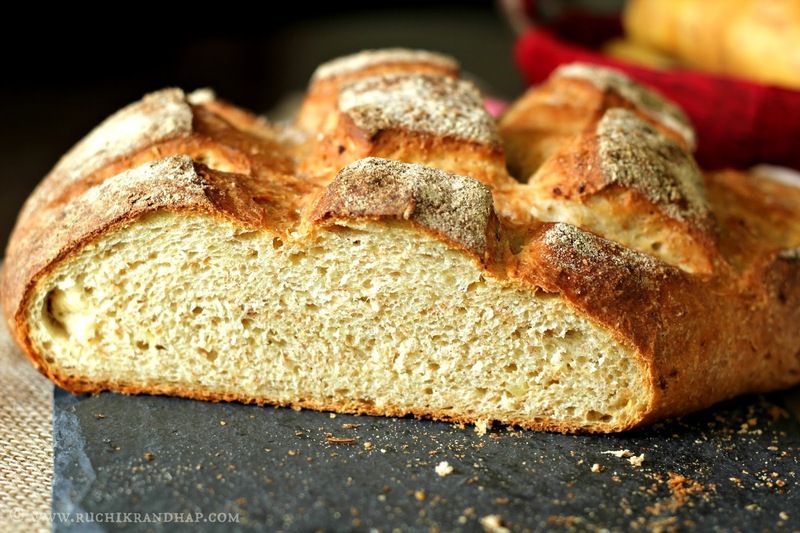 This is a gorgeous and rustic bread that can be shaped as you please, preferably into a boule. Traditionally the addition of potatoes was made with an intention of stretching the penny as white flour was expensive. Potatoes not just helped keep meals frugal but also ensured that the bread remained moist for longer. Wholemeal flour is also added that gives the crumb a slightly dense texture which is great to mop up curries or soup, not to mention its higher nutritive value. The crust is slightly chewy but delicious and we loved how the criss cross pattern on the top dusted with some flour looked like once the bread was baked. I spent a lot of time taking pictures as breads are my favourite subject. 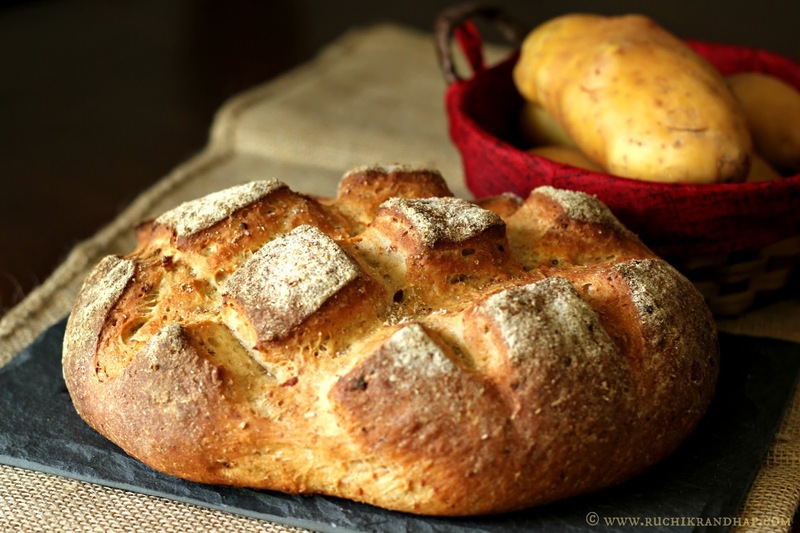 Caraway seeds and chopped chives are added to the bread to give it a mild, pleasing aroma and taste. I skipped the chives but added a sprinkling of caraway seeds that resulted in a light, savoury and delicious bread. Next time I am going to add cheese to the dough as my kids love it. As you can see in the picture below, I slathered the bread with spreadable cheese before serving it to my kids. 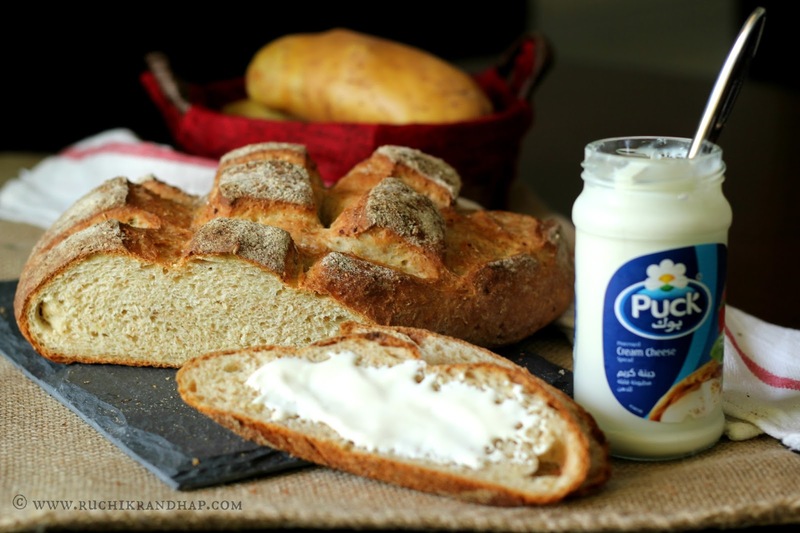 I big thank you to the host of this month’s bread, Pavani of Cook’s Hideout for this lovely theme! Thanks Pavani! 1. Lightly grease a baking sheet. Keep aside. 2. Bring a saucepan of water to a rolling boil and add the potatoes, cook till tender. Reserve 1 cup of this water and discard the rest. Mash the boiled potatoes well. Keep aside till required. 3. In a large bowl, mix the yeast, flours, salt and caraway seeds together. Rub in the butter till the mixture resembles breadcrumbs. Add about 2/3rd cup of the reserved (and slightly cooled) potato water and the mashed potatoes and mix everything well and work into a dough. Add the rest of the water only if required. 4. Tip the dough onto a clean, lightly floured working surface and knead gently for about 7-8 minutes till pliable. Then place the ball of dough into a lightly oiled bowl and cover with an oiled clingfilm. Leave the bowl in a warm place till the dough has doubled. 5. Turn out the dough onto the working surface and gently punch out the air. Knead lightly and shape into a plump oval about 7 inches long. 7. Preheat oven to 200 degrees C. Using a sharp knife slash the top of the dough with 3-4 diagnonal cuts (deep gashes) to make a criss cross pattern. 8. Bake for 30-35 minutes or till golden and sounding hollow when tapped on the base. Remove and allow to cool completely on a wire rack. 9. 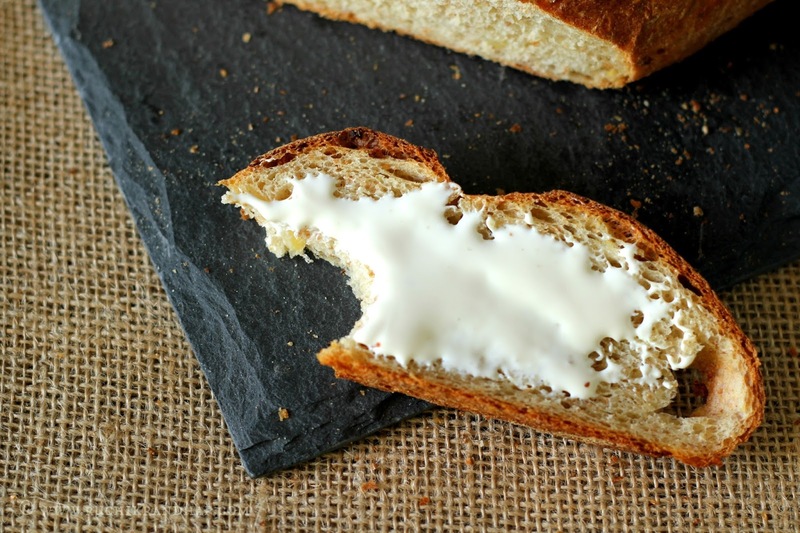 Slice and serve with butter, cheese or a savoury spread. 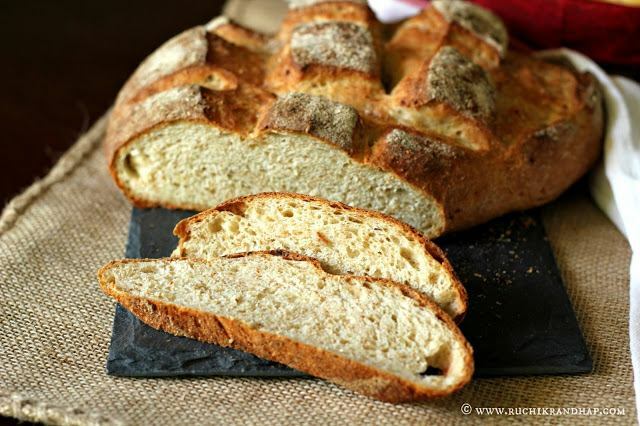 I LOVE such rustic breads. 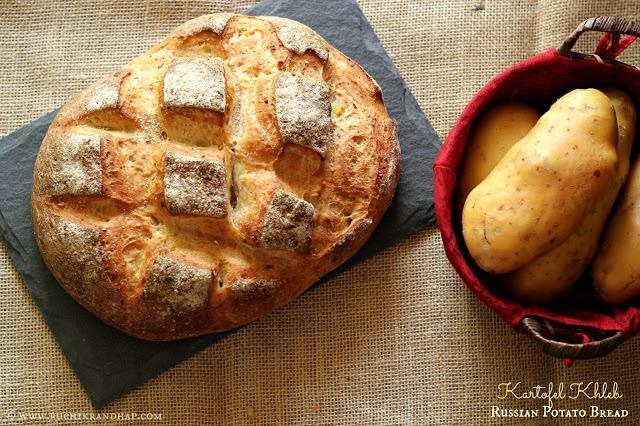 Your potato bread looks fabulous!! You've shaped this loaf so nicely and it is stunning! 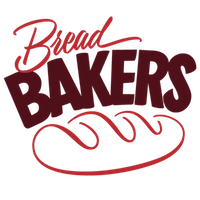 Welcome to Bread Bakers! I hope you enjoyed this months theme as much as I did. Your loaf of bread is just beautiful! Potatoes seem to be the big winner this month and I can see why. This loaf is lovely. What a beautiful bread that is Shireen. Looks absolutely stunning. Love that crisscross pattern on the top. I love the flavors in this, Shireen. 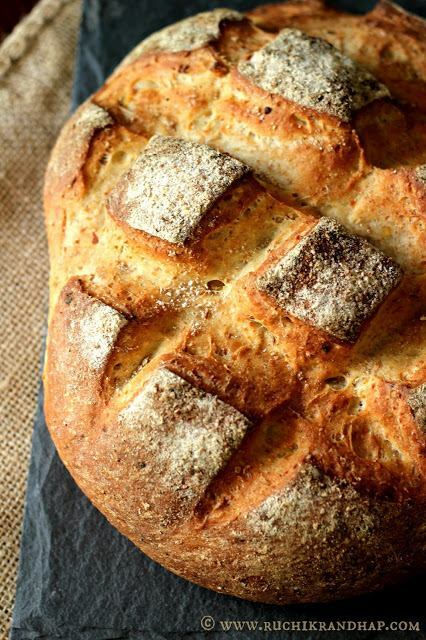 It's a beautiful, rustic bread and the crust looks to die for. What a perfectly terrific crust on that bread. Not just the color and texture, but even your slicing on top turned out without flaw! Gorgeous!